These little skinks get their common name from their lack of movable eyelids. They are most often found in rocky beach areas, between the lines of low and high tide. However, McKeown points out that they have been recorded as high as 3200 feet above sea level in the Kau Desert region, near Volcanoes National Park. 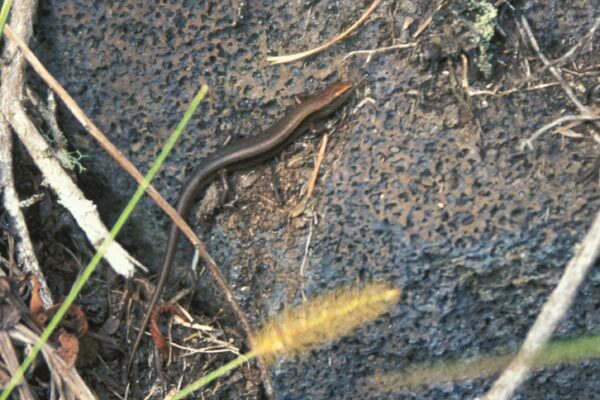 This little basking fellow was far from the sea, near the bottom of the spectacular Kilauea Iki caldera. We saw a few more in the Kau Desert, and a few more off the delightfully named Pu'uhuluhulu Trail, and finally we saw a couple down on a rocky beach near the northern tip of the island.